Staff are in the process of compiling a database of possible destinations to be signed (districts, parks, civic centers, schools, libraries, landmarks, and other public facilities). These, combined with your input from our previous wayfinding survey and outreach meetings, will be prioritized and mapped to the most appropriate bikeway corridors. While signs will be planned for eventual placement along all existing bikeways, and guidelines created to install new wayfinding signage for future bikeways, implementation will proceed as part of the current project for select bicycle-friendly streets in the 5 Year Implementation Plan, as well as select existing bike lanes and paths as needed (depending on how far we’re able to stretch our available funding). There are some challenges that come with designing a wayfinding system for a city as large as L.A. (467 sq. miles to be exact). One consideration is the varying density of the street network among different regions (for example: the Valley vs. Downtown). The number of travel lanes on a street will determine the distance a sign should be placed from the intersection. Well-executed signage placement will ensure that bicyclists have enough time to prepare for a turn if needed. 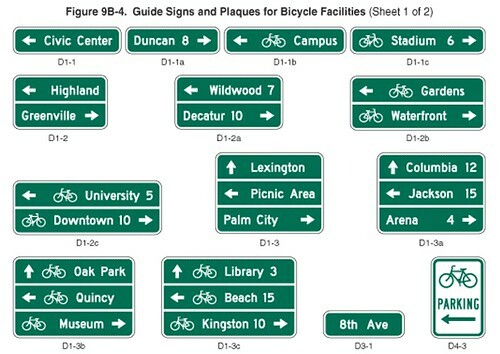 Do you know of a corridor that could benefit from bicycle wayfinding signage, or a destination that should be included? Feel free to leave comments and suggestions below or email Bicycle Coordinator Nate Baird at nate.baird@lacity.org with your ideas! Most of the bike lanes that have recently been put in are along major corridors which makes it fairly easy to understand where you are. Its the paths along waterways, transit lines and parks that are more difficult to know how to get somewhere. Traveling along bicycle friendly streets will also be more confusing due to having to travel in less of a grid pattern compared to arterial streets. I’ve struggled a bit with this request as I’m not sure what’s expected of us- to if not checked out the mapping online at least have a paper map? If not then it’s not big print signs so much as actual maps we can pull off the road to consult in as you say the special cases downtown etc. I think many people take routes that are not just illegal but not shorter enough to be what they would still take if precisely localised maps could be found at every intersection or each side of every bridge. For me ultimately the routing that had the least toxic air mattered most and finding these ways is beyond our ability in the community even. My prayer therefore is whatever funds you have be spent on additional sensors even just simple hacked home monitors connected up to $50 including first years service cell modems to get the 24×7 data so one can limit how many weeks of longevity not just present cognition one loses for every day drowning without scuba gear. Scuba gear -refilled outside LA (perhaps a rail car could be reserved for the tanks inport/export)- is not that expensive to own and operate. Public signage should mention passage without an air supply is known to cause cancer not just asthma etc. Someday we will look back at this era without BYOA disclosures with horror. For children born into the boiling lobster pan nothing less then evacuation- like those nearly certain to ‘catch’ aids in certain hoods internationally would not be an overreaction. Your comment about placement for distance for bikes needs to recognise that vicual correction is optional for us. I normally don’t own presecription (correcting) eyewear so often have difficulty finding my way from too small print signage. Using high visibility icons not just more square feet solves this as does helping us access corrective paintball style goggles. Those masks literally mask our faces which if widely adopted offer tremendous liberty and if correctly greater safety for all. I have difficulty with the concept if you meant it literally of navigating at speed surrounded by cars. I need to know before I’ve passed the point of no return what I’m going to be doing to get back to safeland and reject accessing that data on the fly however routine it is for problem drivers to do that. Additionally: none of the examples show what direction the path will send one in. I think we as a community are literate in two dimensions and that should be resepcted and catered to more then ‘destinations.’ It is car culture that has you caring more about the ultimate destination then the direction of the journey. We are relatively rarely unaware of where we are headed but it is often impossible to know what ‘exit’ goes further north or the opposite of our present course. Cars because they can’t be adequately accomdiated with efficient grid paths require such launching into highway space and rentry into civilisation but bikes are actually friendly to any path so it’s onlywhen we find even ordinary paths so polluted by them tha we deviate from nearly birdflight or whatever it’s calkled routing. This ‘pixelation’ problem of safe routes should when magnetic north is accessible at least have youexpect it’s usage as standard equipment. Google will not be neccessary in la for road mapping. We as individuals can crowdactively draw them for half a dozen dollar microchip distribution. Frankly i’ts mere megabytes that’s needed- and instead we people spend billions on 3rd world wireless networking torent the data insteadof dollars on gigabytes to own freely. HOw muc hlonger will we tolerate this? It’s not necessary to measure how long it takes to hear the time from diffrent spots in outspace to know where we are- counting the number of times our wheels spin, period, and during which revolutions of them we turn is all that’s necessary. our crosswalks talk- sharing the maps would let those among us of varying abilities do far more then cross the street. 500 square miles of people means we have enough people to do things on our own- and your ‘green’ sign budget is mor then sufficent to provide everyoen with a bike a gadget with all the data they’ll ever need. We can look down from above- via a thing called map- and all you offer is smellier cheese within a still bizarre maze. sorry a minor caveat- I’m so old school as to both remember a time before boxes only rich people still own that overly pride themselves on never asking us ot tell them where we are-BUT contain within them all the data they display beyond othat, and to have great contempt on most of us peasants now being gouged to as google recently bragged when we go camping only get the maps back in our pocket instead of only when broadband is around and then only fleetingly athte price of everyone knowing where we are and have been. Google has b roken it’s vow to do no evil by subsidizing the car industry in using those of us who bought it’s stockand more then pay it’sbills to guarantee debt- claiming overcollatorising by considering what people on papepr owe on there car, as if them being worht a tiny fraction of that is some sort of secret? So that means there is no reason to abandon the rarely on bikes and then … getthis.. often without color or large touch screen because of the power requirements of listining to satellites. WE built the dam roads- but don’t get to own in contemporary media there maps? That’s bulshit of fermented to internationallly severe ripeness- and this town has it’s own website- but where is the link to download onto an ipad the vectors for every sqaure inch of asphault not just concrete? We measure the torque our feet generate- even thnough that costs ‘four figures’ per wheel, but have no free public access to the data that kids need to connect to there steering wheels to havea bottemess list of places any turn will go bubble up tothere screen? A place to upload there film taken after every trip or even if only when they get back to school for others to see? I fail to comprehend how this can be so. I know how it happened to transijt- I was there. Originally the ‘computers’ tapped into the odometers and got sold for free- for a fraction of the fuel etc. savings there optimisation offered. I’ve noted many years ago that domestically no transit data ever got put on these ‘magic’ boxes when theyfinally became pocket sized and available to anyone with a hundred bucks to invest. (now a dozen or so at pawn shops incas you have not noticed and far less then that to manacture especially if sheeding of the radio that’s notworth it’sweight). IN Europe though the data did get put on them. I’m not kidding. I however grew up in a town that still denies the internet any data about it’s transit! (usable form) LA and again this is not satire- still uses SMS for it’s bus stops! our bike computers don’t use sms to ‘share’ hte plates ofr all cars within site of us.. and we die nearly daily for that oversight. My point is simple. Your but-naked and people don’t see it because there starving from being wrongfully denied the knowledge of the public space they’ve bought. I understand how you don’t want us toknow what we own- the bills for it, not the fact of it, being unpaid and it being suicidal as if we are when we are NOT only our leaders being so madly motivated to have us drive the world to wanton whimpering, child death and sterility so horrific cess pools are like heaven in comparison. Anyone of numerous formats is fine. Post the link on here to save us attorney costs…….